Who is Bane? Is he nothing more than a comic book character used by Tom King and David Finch for this multi-part story-arc? And if this is the case, how come DC Comics have been allowed to publish two of them in March, 2017? Want to know why? Then please check out the following double-review. TO QUOTE Olusegun Obasanjo: 'Corruption, the greatest single bane of our society today'. Part three of 'I am Bane', also known as issue 17 of Batman, starts off in a very suspenseful manner. Now it goes about doing this by initially 'mortally wounding' one fringe member of the Batman Family, while the rest of the book tells a tale about Bane and his henchmen capturing each member of the Batman clan, one person at a time. So throughout this adventure you'll be able to witness Bane and some of his old stalwarts, including Trogg and Bird, minus Zombie, going around town and doing stuff they shouldn't really be doing: Like shooting ex-assassins in the stomach, hitting women over the head with a stick, and generally mugging people of a certain age, etc-etc. 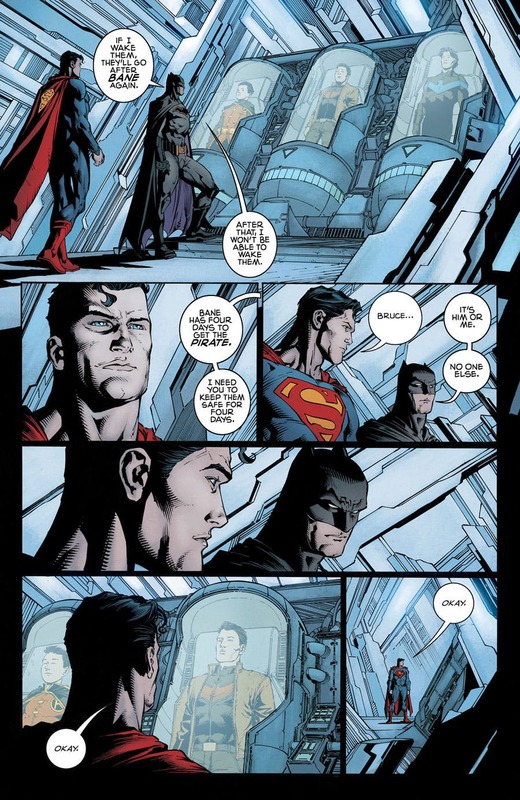 Somewhat astutely, Batman has managed to pre-empt these attacks by locking some of his allies away in Superman's Fortress of Solitude, namely, Robin, Nightwing, and the Red Hood, presumably because they tried to defy his orders in between chapters. But as we all know from last months episode, they weren't the only members of his inner circle who were willing to go against his wishes, tut-tut-tut, naughty-naughty-naughty, and as you can most probably guess, that particular stance never really worked out for the best. Don't worry though. Nobody is dead yet. Although from the looks of it, I can't say that for much longer. Over in another section of this story Alfred and Gotham Girl break into Arkham Asylum with the intent of finding the Psycho Pirate and using him to cure her. Now I must say, I really did enjoy reading this section, especially since Alfred took the main lead in it. Basically, the two of them dress up (Alfred as an orderly and Gotham Girl as Hush) and together they make their way towards the Pirates cell, where Alfred holds a gun to his head and tells him what to do. 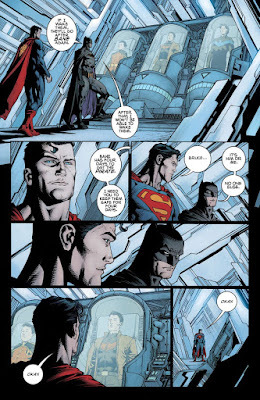 Meanwhile, while this is going on, Batman is standing on a rooftop somewhere and... and... and... and... ehhh? To be completely honest, I'm not quite sure what he's doing! Press ups? Looking for his contact lenses? Waiting for the right time to strike? Either way, more or less he doesn't do very much throughout this issue, which can't be said for the other members of his team. Again, without divulging too much information, Commissioner Gordon, Catwoman, Bronze Tiger, and surprisingly, Thomas Duke, all have roles to play in this issue. Roles, which I must stress, nicely flow into issue 18 of Batman. 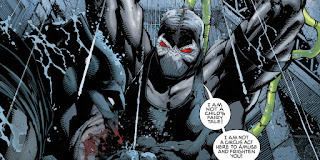 As its here, in part four of 'I am Bane', where... oh? Now how can I put this? Do you remember how the last part of 'I am Suicide' played out? With Batman distracting Bane by using himself as a human punching bag, while Catwoman bides her time to deliver the killer-kick! Well, that's kind of how one section of this issue plays out, as it's mainly focused on a one sided fight between Batman and Bane, thus giving Catwoman the opportunity to shift the flow of battle elsewhere (just not in the way you may think). Personally, I wasn't a big fan of how this section was relayed on the page. For one thing, I don't like seeing Batman getting bested in a fight; where as another, I wasn't too keen on this repetitive nuance in Tom's writing. 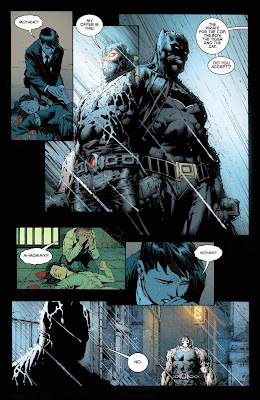 Having said that though, there was something about issue 18 I did like, that being the flashback sequences involving a young Bruce Wayne and a young Bane. You see, in between their tussle, there was another strand of the story which depicted how each of them coped with the loss of their parents, specifically, their mothers, who they keep referring to throughout it's telling. This ranged from their initial deaths, who looked after them during the aftermath, how they were able to mourn their loss, how they trained to become the person they are today, right up to the moment each man acknowledged that the other one existed. Indirectly this section reminded me of another Batman story, 'The Player on the Other Side', which was published in 1984 and created by Mike W Barr, Michael Golden, and Mike DeCarlo. 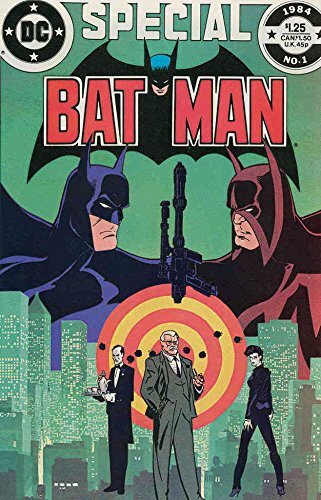 Essentially, both of these books compare Batman's origins with a known enemy and showcase's why each party took the path they ultimately took, doing so without trying to be too judgmental, whilst keeping in mind the similarities in their tales. In Batman's case, he had a privileged upbringing and was surrounded by people who cared for him. Where as in Bane's case, he had none of these things, which kind of explains -- I said 'kind of' -- why he's a bit of a self-centered prick. Quickly moving onto the art department, and, Oh My God, what can I say about David Finch's exquisite artwork? It's amazing. It's awesome. It's fantastic. It's a classic representation of each character for the modern era, with a special mention going to Danny Mikki and Jordie Bellaire for their part of this equation, both inks and colors, with all factions producing poster worthy pictures for each page, especially those double-page spread's. So all in all, yeah, good job, great art, and an interesting future for Batman and co. Say no more. I've answered this question already, haven't I? So once again, for previously explained reasons, I'd like to compare these comics to the 1984 Mike W Barr and Michael Golden classic, 'The Player on the Other Side'. Dressed up as an old woman. 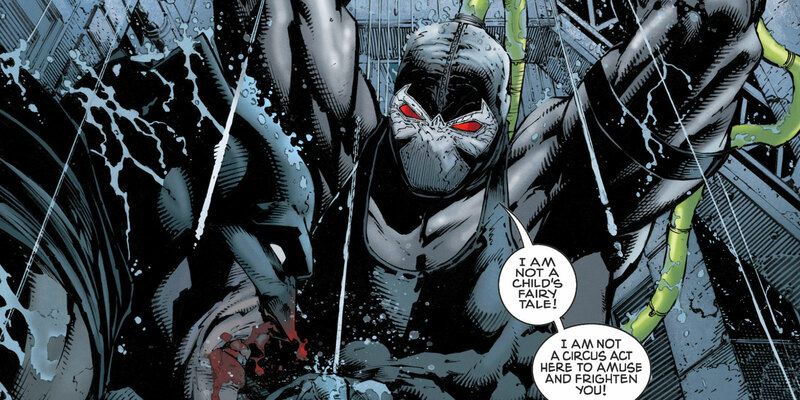 Hit Bane over the head with a fish! Sung a rude song about sitting on someone's face. Had an argument about arguing. Made a film that poked fun out of religious organisations.